Long ago, back in the time of flower power and counter culture, I grew my hair long and lived for a while in a shabby fifth floor walk-up that had few amenities but was flooded with bright sunshine all day long. That gorgeous light was no doubt responsible for the obvious good health of the young marijuana plants that were growing in a pot on a windowsill. I can’t tell you anything about the potency of that crop because someone apparently panicked and destroyed it before it could be harvested. Had we only known that marijuana’s foliage bears a remarkable resemblance to that of the ol- fashioned garden stalwart, Cleome. It’s entirely possible that we could have passed off our plants as a totally legal flower and, thus, saved the crop. Search for Cleome hassleriana on gardening advice websites and you will inevitably find queries from people who have noticed the deeply cut palmate leaves on the seedlings and gotten nervous about what plant they have actually purchased at the garden center. Not to worry, as the plant matures and develops its distinctive space-age flower heads with their pastel petal clusters and long, whisker-like stamens, the similarity with marijuana totally vanishes. Above: Tall pink Cleome ‘Clio’ brushes against Salvia ‘Waverly’ with silvery cardoon (Cynara cardunculus), hot pink Gomphrena ‘Fireworks’, and lime Ipomoea batata ‘Dwarf Marguerite’, which keeps the composition fresh. Photograph by Marie Viljoen. 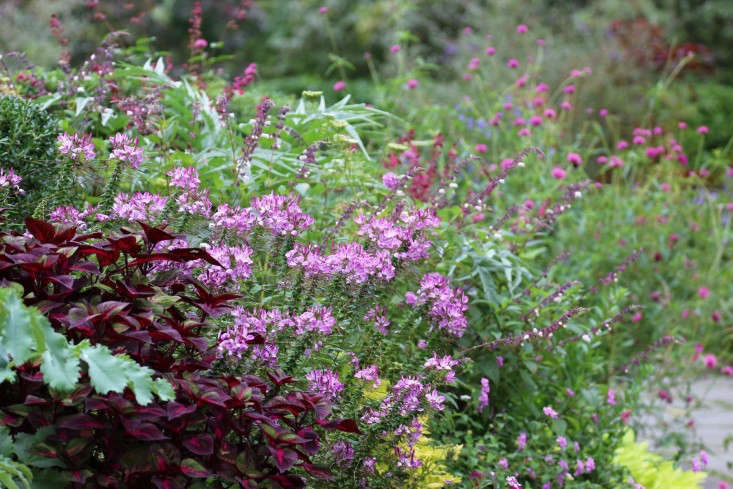 For more see Color Theory: 10 Perfect Plant Combinations for Autumn.